Cartoon Country: Looking Back – Chowder | TWINSANITY! A discussion on Toon Zone sparked this; today I’ll be looking back at a since departed cartoon, Cartoon Network’s Chowder. For those who don’t know, Chowder was an American animated television series created by C.H. Greenblatt for Cartoon Network. The series followed an aspiring young chef named Chowder and his day-to-day adventures as an apprentice in Mung Daal’s catering company, located in the magical surreal fantasy setting of Marzipan City, a cross between a Dr. Seuss book and a Peter Max painting, populated by humanoids, anthropomorphic animals, pixies, robots, monsters, giants, dragons and not-quite-certains, where all of the characters were named after foods or dishes. Although he means well, Chowder often finds himself in predicaments due to his perpetual appetite and his nature as a scatterbrain. He is also pestered by Panini, the apprentice of Mung’s rival Endive, who wants Chowder to be her “boyfriend”, which he abhors. The series was animated with both traditional animation as well as short stop motion puppet sequences that were inter-cut into the episodes, and that ran over the end credits. 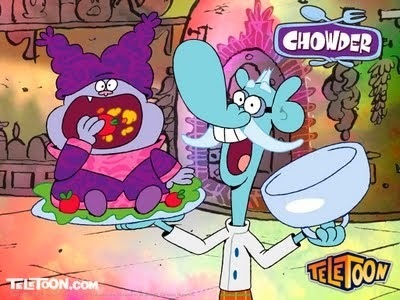 Chowder premiered on November 2, 2007, and ran for three seasons with 49 total episodes. It garnered one Primetime Emmy Award win, six Annie Award nominations, and two additional Emmy Award nominations during its run. The series finale, “Chowder Grows Up”, aired on August 7, 2010, and features C.H. Greenblatt as the voice of the adult Chowder. As of June 02, 2014, Boomerang has begun airing re-runs of the series. I’m not ashamed to say it: I loved Chowder when it first debuted. It was a glimmer of goodness in an otherwise mostly forgettable era for Cartoon Network. Fun fact: the show was originally going to be about a wizard’s apprentice, but somewhere down the line while still in pre-production the show was morphed into a series about an apprentice chef, and while part of me wonders what the series would have been like had Greenblatt stuck with his original concept, I still dug the show when it first came out. The cooking premise was definitely unique and not one which has been utilized a lot in animation, or anywhere else outside of Food Network or the Cooking Channel. I loved how kooky and whimsical Chowder was, its’ world and its’ characters, and how different it was from everything else that was on CN at the time. In its’ initial season, people were touting Chowder as the show which had the potential to be CN’s equivalent to SpongeBob Squarepants, and I was one of those people who saw that potential in the show. Unfortunately, around midway season 2, things started to flag. The theme of cooking and making unusual recipes and questing for ingredients for said recipes and tackling catering orders got abandoned all too quickly, the characters (especially Chowder himself) became extremely dumbed down and 1-dimensional caricatures of their former selves each with a single trait cranked up to 11, the characters began breaking the 4th wall to the point of sheer irritation, the cast (again especially Chowder himself) began shouting all of their dialogue, the writers began shoehorning Gazpacho (one of the show’s funniest characters, admittedly) into every single episode regardless of whether the story actually called for him or not, and by the end Chowder had just devolved into a goofy random cartoon about weird people doing weird things with no rhyme or reason, with the only remnants of the original premise being that everyone and everything was named after foods. By the time the finale came along, the damage had been done. When looking back on Chowder, I try to only remember it’s first season and the early part of the second; I try to pretend the rest of the series simply doesn’t exist. ← Why Gear is Awesome! I saw an episode or two, and I remember it being decent. But it came out of a time when I had little interest in cartoons at the time. BTW, thoughts on Bad Seeds? I honestly don't know what to think of Bad Seeds, because I know very little about it other than C.H. Greenblatt will be working on it. I suppose I'll give it a look when it premieres. I only caught 1 or 2 episodes of Fish Hooks, and I never felt compelled to follow it because high-school based shows aren't really my thing, but I'm willing to give Greenblatt the benefit of the doubt because the man can deliver some quality entertainment when given the right outlet. While I felt that Chowder took a noticeable dip in quality about halfway through its' run, I did then and still do love the overall concept behind the show and when Chowder was good, it was very good. To be honest, I actually thought the fourth wall jokes were among the best parts of Season 2. Of course, I'm a huge fan of meta jokes in general, and comedy as a whole is extremely subjective subjective, so it probably helps that I enjoy that kind of humor. 2. It breaks suspension of disbelief by constantly calling attention to the fact that it's a work of fiction, and the audience therefore shouldn't get emotionally involved with anything that's happening. I don't mind the odd meta joke lightly sprinkled here and there; for example I enjoyed the joke involving the CN logo in “Gazpacho Stands Up” and the gag in “The Sleep Eater” when Chowder metas Truffles out of the episode, but as the show progressed, the writers began relying on meta jokes way too much, to the point where it came off as sheer laziness. Oh, let's just break the 4th wall again instead of actually coming with something clever or funny that could help flesh out the characters or further the story along.